FLORHAM PARK, NJ (April 30, 2015) – Early childhood nutrition leader Gerber announced today the launch of its newest products, Gerber 3rd Foods® Lil’ Bits™ recipes. This new category innovation features a unique and revolutionary cooking method that gives Lil’ Bits™ recipes perfectly-sized soft pieces to help babies master the essential chewing developmental milestone. 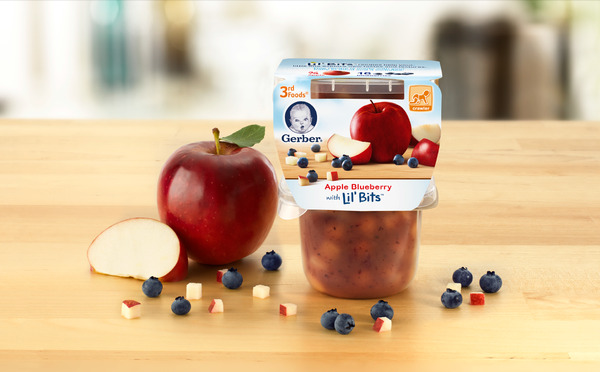 Gerber invested over $100 million in technology to create Lil’ Bits™ recipes and worked with 80 experts who spent over 120,000 hours developing the product. Research found as older babies develop side to side movement of their tongue, they can begin to move small, soft pieces of food to their jawline for mashing – the early skills of chewing. Introducing pureed foods with soft pieces at this time allows children to explore multiple textures before transitioning fully to solid, table foods. Additionally, Gerber hosted 80 taste tests and shared over 30,000 spoonfuls of Lil’ Bits™ recipes with a panel of babies to ensure the product not only helps in chewing but also has a baby-approved taste. Lil’ Bits™ recipes are now available at major retailers. Additional information about the product, upcoming promotions and chewing milestone tips for parents can be found by visiting Gerber.com.